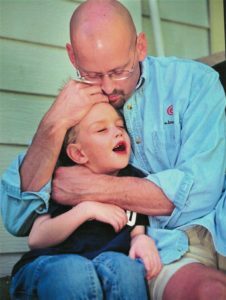 Patrick Sheridan, Global Division Manager for a software company and father of two young children, began to develop pain in his neck and shoulders. Although he sought out physical therapy and then acupuncture as ordered by his primary care doctor, the pain persisted. An orthopedic specialist finally ordered an MRI scan that revealed a concerning mass in his cervical spine. Pat was referred to a well-respected teaching hospital in another state where a neurosurgeon successfully removed the mass. Based on the preliminary pathology report, the surgeon reassured Patrick and his wife, Sue, that it was a benign tumor and that he did not need further treatment. However, unbeknownst to the Sheridans, over the next few weeks additional tests were performed on the specimen, resulting in a final pathology that was faxed to Patrick’s neurosurgeon. Apparently, the final pathology was filed in Patrick’s medical record without the neurosurgeon ever seeing it. No action was taken. Meanwhile, Patrick and his family celebrated what they thought was his recovery. But, six months later, the pain was back. The lost pathology report was now discovered. The final diagnosis turned out to be an aggressive, malignant sarcoma requiring urgent treatment. During the six months of non-treatment, the tumor metastasized and penetrated his spinal cord. Patrick endured seven surgeries and several rounds of chemotherapy and radiation, but the cancer persisted. At the end of Patrick’s life, he was paralyzed from the neck down. He died in 2002 when he was 45 years old, leaving his wife and two children - ages four and six. The Patient's Toolkit for Diagnosis is a resource created for patients, by patients.